Aurora Robson isn’t just an artist — she’s also an environmental activist. The Canadian-born artist’s elaborate sculptures are made from cut-up plastic bottles and other bits of discarded plastic, which are sold to support further environmental reclamation and awareness. We’ve tracked Robson’s evolution here on Inhabitat, featuring her work, first in 2009 and also earlier this year. Joshua Kogan posted on his website, Localflux a short documentary about Robson. Click through to see the film. 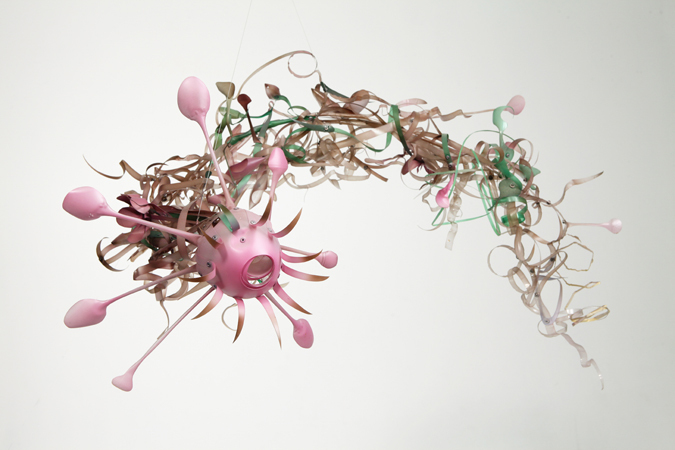 Robson’s work raises awareness about plastic waste, which often ends up in the oceans. “It’s a wonderful opportunity to give people space to reflect on their behavior and on their relationship to matter and material that they come across in their daily lives,” she explains in the video. Robson wants her art to help people recognize the power they have to make positive choices as consumers to use less wasteful products. See more of Robson’s work at her website. Aurora Robson isn't just an artist -- she's also an environmental activist. The Canadian-born artist's elaborate sculptures are made from cut-up plastic bottles and other bits of discarded plastic, which are sold to support further environmental reclamation and awareness. We've tracked Robson's evolution here on Inhabitat, featuring her work, first in 2009 and also earlier this year. Joshua Kogan posted on his website, Localflux a short documentary about Robson. Click through to see the film.